A. Baptism is an incredible step of faith and obedience. Throughout the New Testament we are given examples of people being baptized, including Jesus! It is a public statement of your belief in Christ and decision to follow Him. It is a symbol of the death of our old life and sin with Christ and the new life that we have in Him. A. We believe water baptism is an evidence of one’s personal faith and understanding of the truths outlined in Romans 6. Because of that, we practice “believer’s baptism.” We believe that it is an action that only believers in Christ should take. Q. Do you baptize children at Liferoads? A. We believe that parents are the best judge of whether or not their child understands salvation and has made their own decision to trust Christ as their Savior. It is typically not our practice to baptize children under the age of 10, but we believe that from roughly the age of 7-10 years depending on the child and their level of comprehension and belief in Christ, they could potentially be ready to make that decision on their own and therefore be baptized. If your child is able to describe why they want to be baptized without too much prompting from you, then they might be ready. We don’t have strict rules on this, but we would suggest that if the parent is making the decision instead of the child that you should consider child dedication instead of baptism. Infant or child dedications are a special time that we set aside during the Sunday service to pray for a family and to commit as a church to supporting them in their commitment to raising up their children in a home that honors Christ with the hopes that the child will choose to follow Christ when they are ready to make that decision on their own. If you are interested in doing a dedication, just let us know. Q. 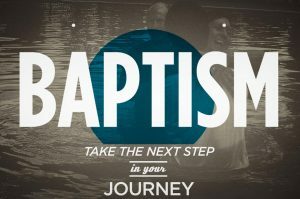 How do you “do” baptisms at Liferoads? Q. How do I sign up for Baptism? A. Fill out this online form. A staff person will connect with you to go over the information on the request form and answer any questions you may have. If you would like to be baptized, please let us know by filling out the online form. When a baptism service is scheduled, we will try to give you at least two weeks’ notice so that you can plan ahead. We do not require you to dress a certain way, but ask that you wear modest clothing. Shorts are fine. Please make sure your clothes are not see through when wet! Please bring a towel or 2 and a change of clothes. You can change into your dry clothes in the bathroom after you are baptized. We encourage you to invite your family and friends to be with you on this special day. They are welcome to come forward and surround you in prayer just before you are baptized! We are also open to the idea of someone besides the pastor (or in addition to the pastor) baptizing you. If there is someone who has played a significant role in your spiritual life, you might want to consider asking them to baptize you or assist in baptizing you. Just let us know before the day of your baptism what you would like to do. A picture of you will be taken just before you are baptized. A certificate and that picture will be given to you as soon as possible. We suggest you keep this reminder and refer to it as you grow in Christ!